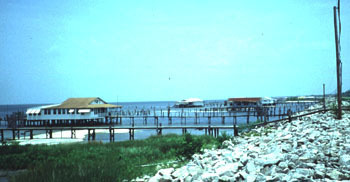 Lake Pontchartrain Camps are big, sort of plain, wooden houses usually with tin roofs that are actually built in the Lake. All of the camps had porches, some all the way around. Some porches were screened to keep the mosquitos and bats out (find out more about that in the "Top 10 Reasons a Kid would want to go to a Camp"). Look closely at the picture and you'll see that the camps are built on "pilings". Pilings look just like telephone poles and are about as long. The camps sat about 10 feet above the water level in the lake. Some people described these camps as "houses on stilts". Every camp, because they sat quite far out in the Lake, had a "walk" or "run" from the shoreline to the camp. Most had a back walk with a fishing pier at the end of it. Many camps also had boat houses--tin sheds where the boat could be hoisted up and kept safe from rough weather. And all camps had steps leading down into the Lake so that you could go down for a swim or a ride in the boat. Camps have been described as modified "New Orleans Shotgun Architecture" meaning that they were often long and skinny on the inside but with porches on the sides and fronts. Other camps were built with "Bargeboard Architecture" (see the Historic Structures link for more about this). Most camps had several bedrooms along with a couple of large rooms. One of the larger rooms was a gathering place for eating or hanging out. A screened porch was usually where the kids slept at night (see more about that in the "Top 10 Reasons a Kid would want to go to a Camp").